Today, we ventured into Santa Rosa. A town about 40 miles south of the Russian River RV park. 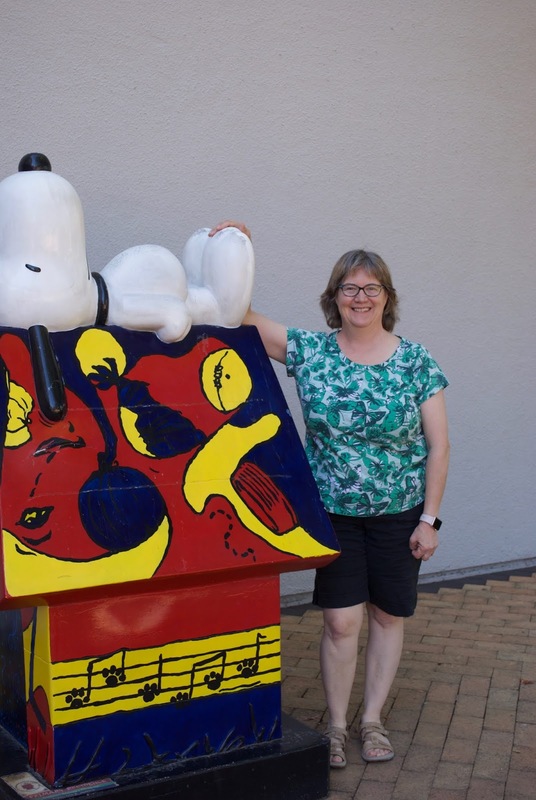 The first stop was the Charles Schultz Museum and Research Center which is built in the area where he had lived and worked. His office, favorite cafe and ice rink are all on the property. 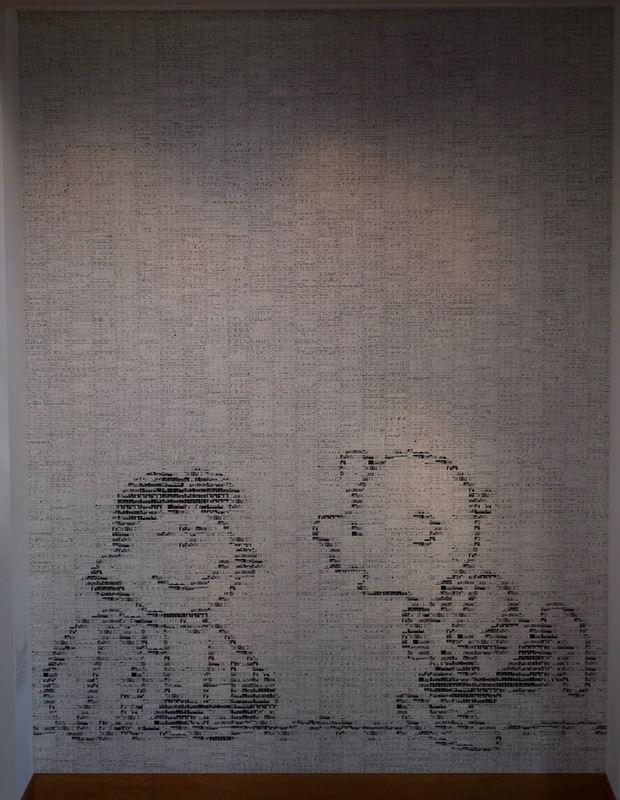 This wall of tiles dominates the entry hall of the museum and if you look at the second picture, you can see that it is made of tiles of Peanuts comic strips. The same tiles are used in other parts of the building including the restrooms. 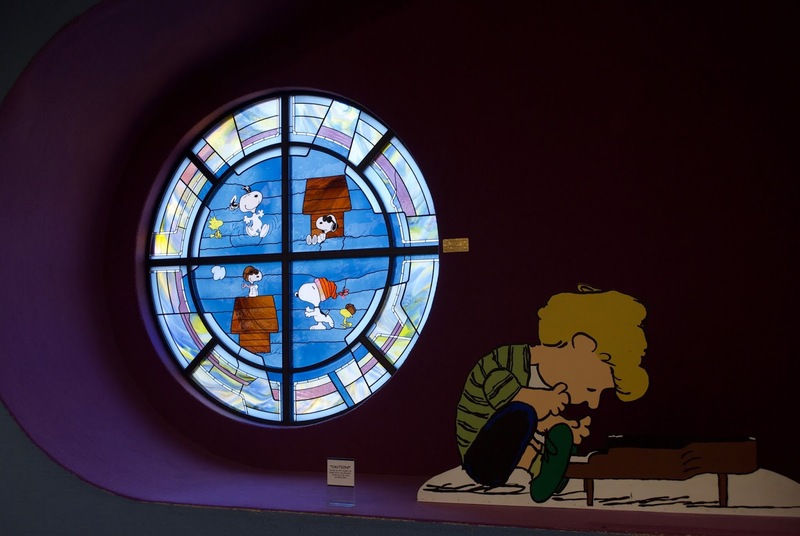 Most of the first floor of the museum are comic strips showing the progression of different characters through the years with a large section on Snoopy. Quite a change through the years. There were other comics featured that had an influence on Charles Schultz through the years. 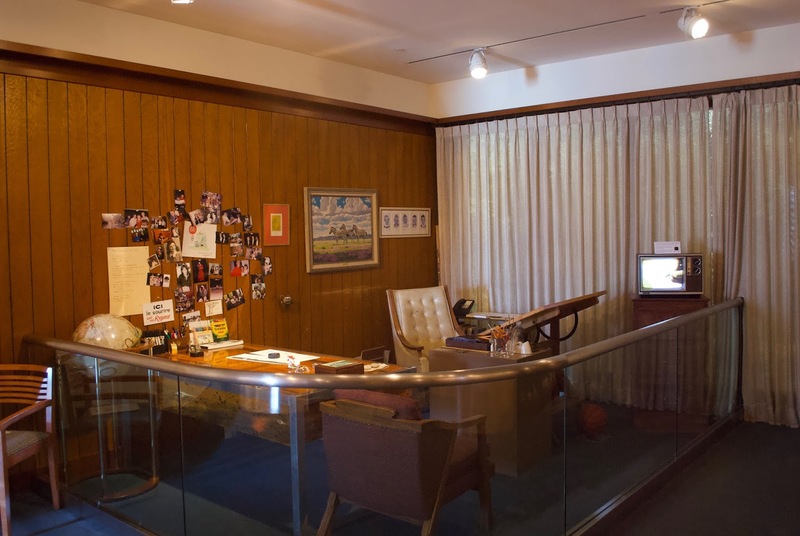 His office was moved into the museum as well as an entire wall from his daughter's bedroom that he had painted with characters. This wall had been repainted numerous times by subsequent owners of the house until one owner discovered it and carefully removed the layers of paint. When she heard about the museum, she donated the entire wall. 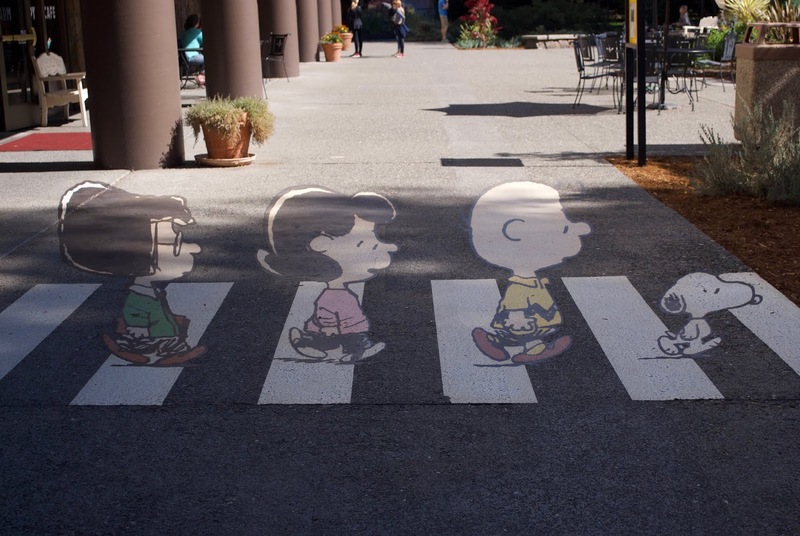 Outside of the museum on the path to the ice rink is the Peanuts version of Abbey Road. 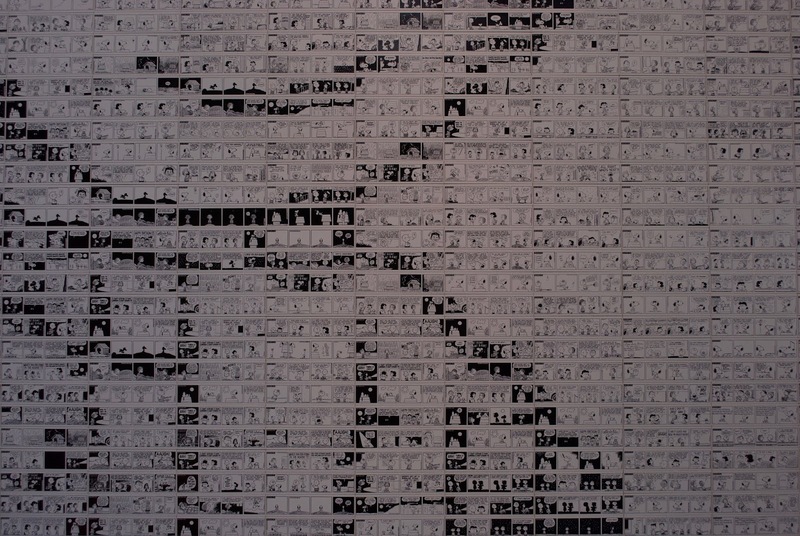 The artwork is flat and must be viewed from a specific spot to get the perspective right. Charles Schultz was an avid hockey player and played a large part in the development of ice sports in Santa Rosa. There are quite a few signatures in the concrete in front of the building by famous skaters. 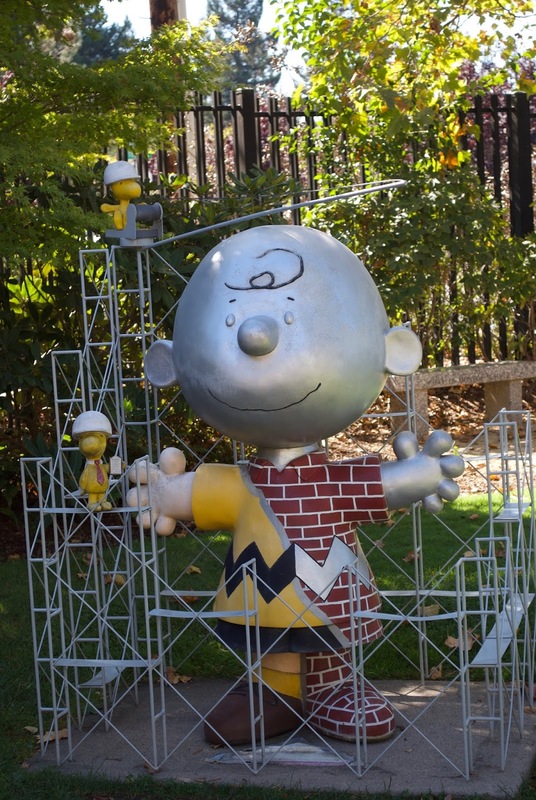 Behind the museum, they are developing an education center and this is the "Under Construction" statue of Charlie Brown right in front of the construction fence. The garden was a nice place to sit and relax in the 75°F afternoon especially since I was the only one out there. 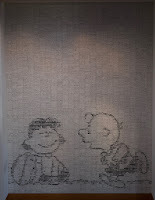 Part of the upstairs display was his last comic strip. It mentioned that it would be the final strip due to health reasons. Shortly after it was penned, he died in his sleep the night before the last strip was to be published. I had initially taken this photo when we arrived but discovered that the autofocus on the lens was turned off. Not sure how that happened or when. All of these photos were taken by the DSLR mostly for simplicity. It has fewer megapixels than the iPhone but a real zoom lens and better in low light. I thought that it would work better inside of the building. Adjacent to the ice rink, there was a shop that had a lot of Peanuts memorabilia and hockey gear. How's that for an odd combination. We also stopped at the cafe but beyond the touristy prices, there was little that distinguished it. After the museum, we headed for Petco and Walmart and arrived back at the trailer around 4:00. Long enough in the weekend traffic. I think I would have enjoyed that museum. As a kid, the Peanuts specials on tv were my favorite. I even have the track "Linus and Lucy" on the thumb drive on the Harley and still enjoy hearing it now and then. How do you find these places or do you just stumble upon them?